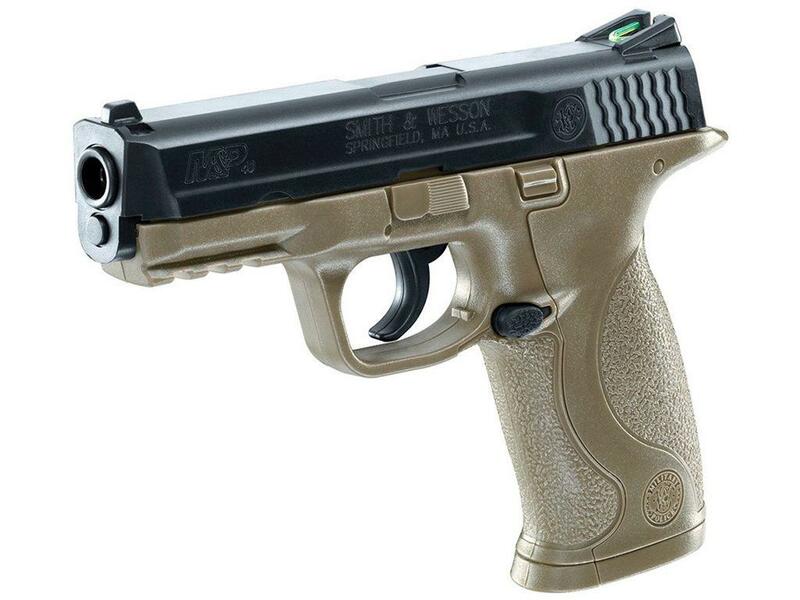 Smith & Wesson M&P 4.5mm BB Pistol | Replicaairguns.ca | Easter Weekend Sale! Trigger Pull: The trigger pull on this gun is medium weight and a bit long, the break point is a bit hard to predict but once you get used to it being on the long side it shoots pretty good. Accuracy: This was my second time shooting the S&W M&P at a target from 20 feet away in a free standing position, and this time it performed not as good as the as the first time i shot it - or should I say maybe I didn't perform as well as the first time shooting? Either way, this gun is capable of shooting a 1 inch group from about 20 feet away. Build Quality: The Smith & Wesson M&P is built about as cheaply as they come with an almost all plastic construction, even the plastic is kind of cheap looking when compared to another mostly plastic air gun like the H&K USP which looks much nicer even though it too uses a lot plastic in its build materials. With that said, the S&W M&P seemed to function just fine. 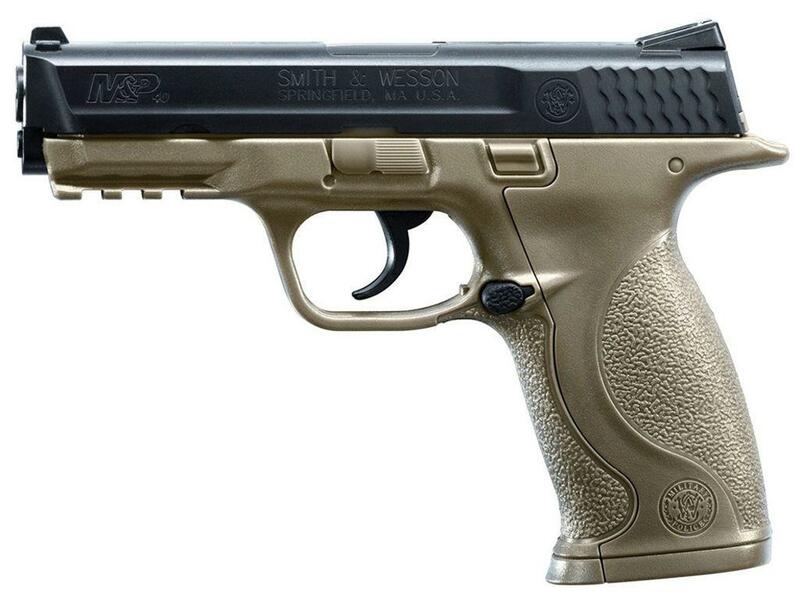 Realism: The Umarex S&W M&P is a licensed replica of the real Smith & Wesson M&P 40 pistol. It is a very close looking copy with the exception of it being mostly plastic and lighter in weight. All metal drop out magazine. Good replica in terms of accuracy compared to the real S&W M&P 40. Would make a great gun prop for TV or Movie. Inexpensive to own and shoot. All plastic except for magazine. Light weight makes it feel cheap. Plastic is very shiny, a more matt finish would have looked better and more realistic. I don't like the screw holes - a dead giveaway. This is another low cost replica air gun from Umarex designed for the more entry level buyer. 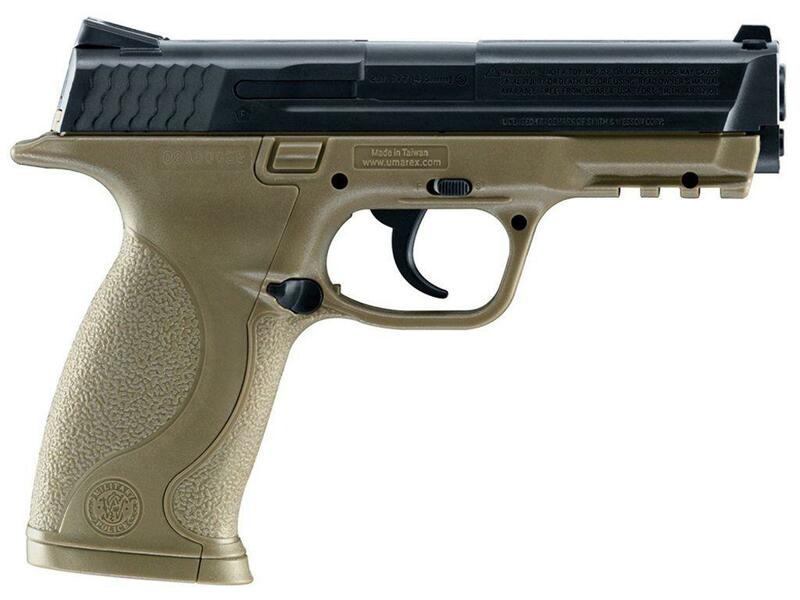 I wasn't a big fan of the Umarex S&W M&P even before I bought it; I purchased it mainly for the comparison review. I have to say the S&W M&P has grown on me somewhat after shooting and reviewing it, as it does shot well and has great sights on it. I like the fact that the S&W M&P is very true to the original pistol in appearance which as I mentioned before makes it a great candidate as a low cost prop gun for TV and Movie sets. 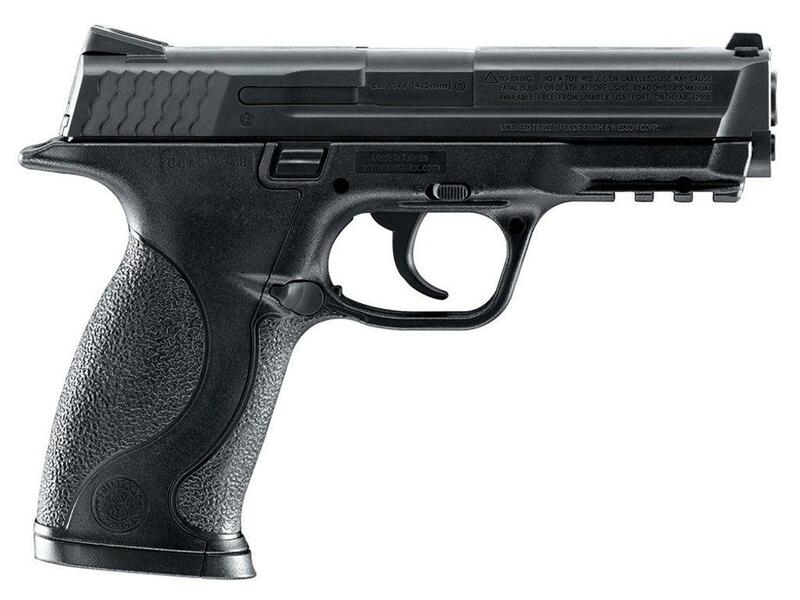 http://www.ReplicaAirguns.com - Umarex S&W M&P CO2 BB Gun Review. 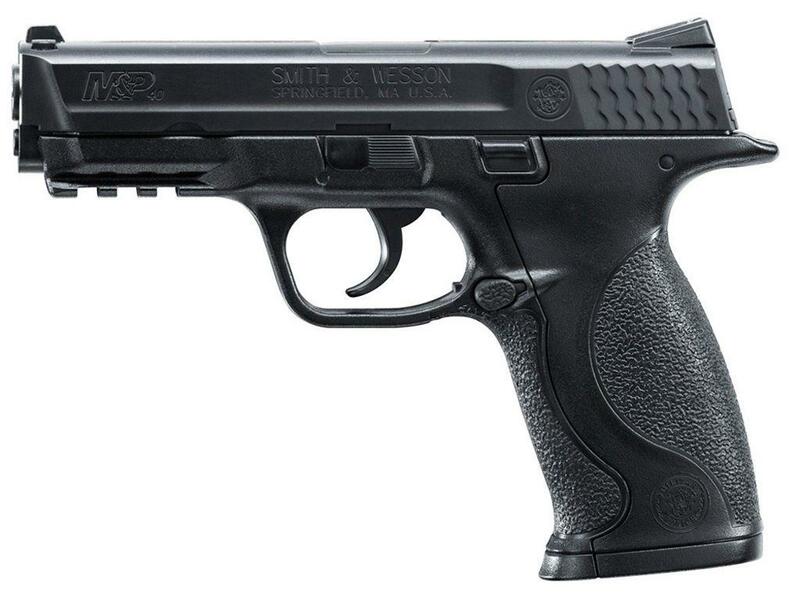 This is a table top review of the Umarex S&W M&P CO2 BB pistol. I show you around the gun and walk you through its basic operation and handling. I have included a target example showing you a grouping I got from 20 feet out with this gun I also got to try out my Chrony Chronograph and report the actual fps obtained by this air pistol. The Smith & Wesson M&P is mostly plastic but does have an all metal 19 round drop out magazine, it does shoot very well and looks almost exactly like the real S&W M&P Firearm. 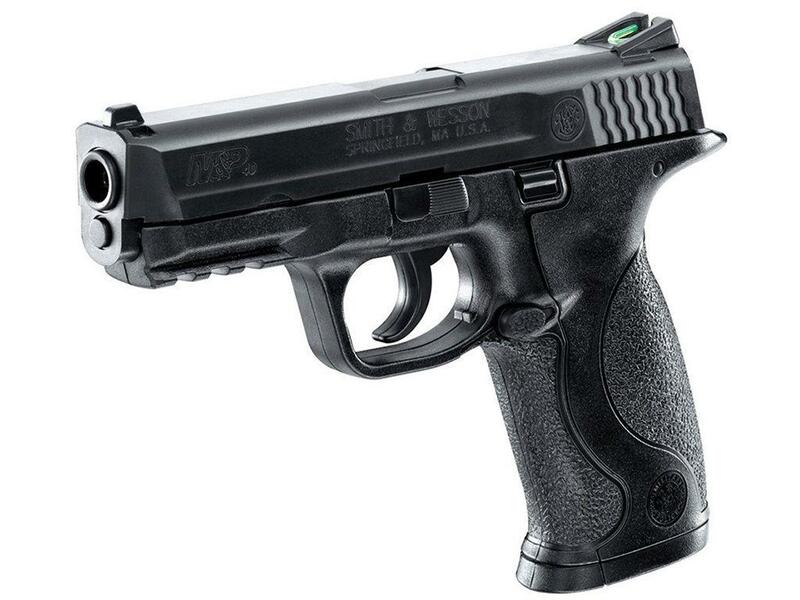 The S&W M&P is a inexpensive replica BB shooter with good power and accuracy and it would also make an excellent prop gun for TV or Movies scenes.